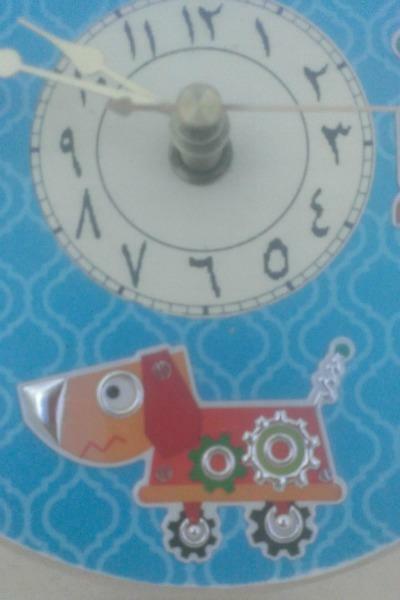 Watch these little robots and their pet dog on gliders zoom around your bright Arabic numerical clock! This handmade unique design is an art piece that no one else in the world has. Its fun beautiful color designs are a cheerful way to brighten up a baby nursery or a children’s room. It might also be fun in a work lounge or dorm room! It certainly will be a conversation piece wherever you put it. 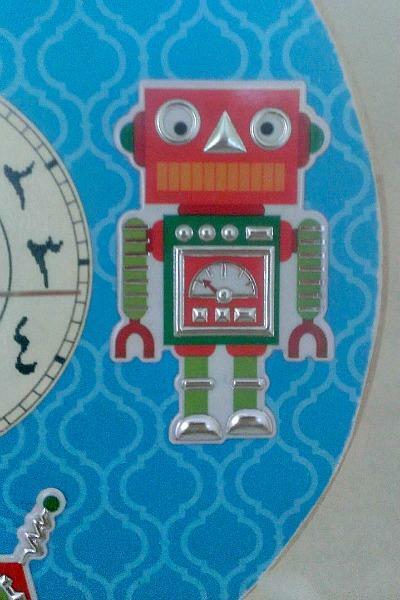 If you do use it in a nursery or kid’s room, this clock is a great introduction to the Arabic numerical system. 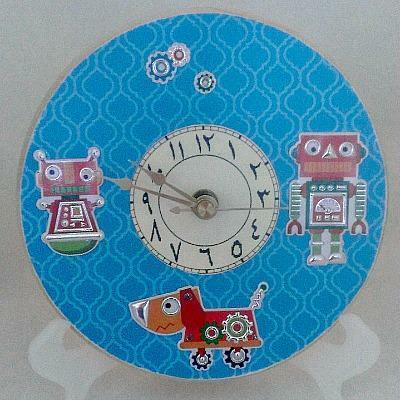 This decorative piece can serve as a wonderful educational tool for teaching children how to tell time by learning how a clock works, and seeing the numbers every day. Discuss the time with your child every time you see it, so that they get used to you saying the numbers. Point it out to them as you enter and leave a room. 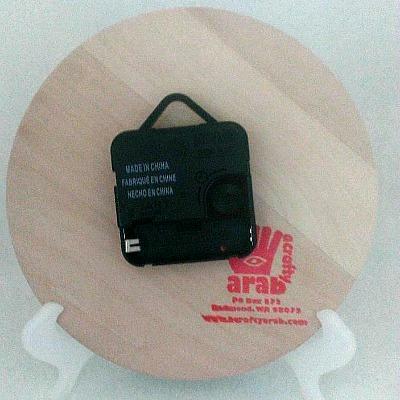 The Arabesque background paper has been applied with a glue medium and covered with a base of three protective coats. 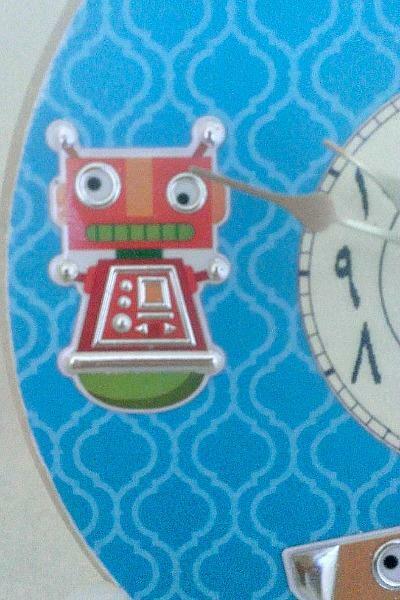 The stickers are three dimensional and just a reminder this clock is not intended to be a toy, it is for décor purpose only. The hands are very fragile and should not be handled often. This clock measures approximately 6 1/2" in diameter, and 1 1/2" in height, and comes as shown in the last photo with a quality Quartz movement. You will need to provide the AA battery. I do custom work, so please contact me if you'd like different colors or themes. 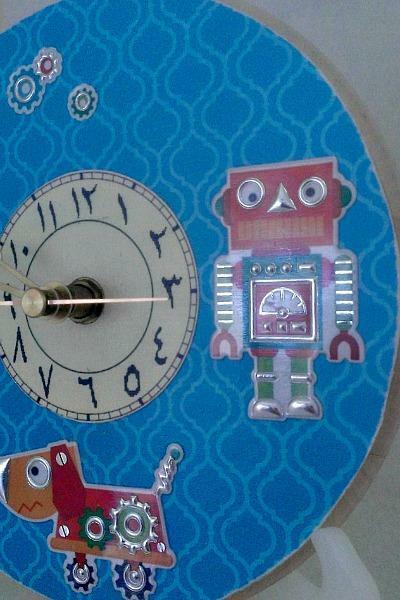 I also do have other clocks available, please visit A Crafty Arab on Facebook for photos.